Another one of the most frequently asked questions we get from our customers is, “What is the difference between water based and oil based poly?” Both oil and water based polyurethanes are like a coat of armor for the hardwood floor below, protecting the wood from damage. Each type of polyurethane is a sacrificial layer that will show scratches and wear marks over time, and both oil and water based polyurethane have their strengths! DURABILITY: If each product is applied properly using quality products, the difference in durability is indiscernible. A lot of clients think that water based poly is not as durable as an oil based poly, but a newer brand, quality water based poly will last just as long if it is well taken care of! 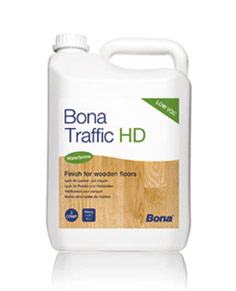 For water based polys, we recommend and use only Bona products, as we feel they are the highest quality water based polys on the market. COLOR: Oil based poly has an amber hue, whereas water based poly is clear. An oil based polyurethane will continue to amber and darken over time, while water based poly will remain clear for the lifetime of the hardwood floor. This color difference is less noticeable over a stained hardwood floor, but an oil based poly will still exhibit an amber hue that will continue to darken over time. DRYING TIMES: Oil based poly takes much longer to dry and cure, and only one coat of oil based poly can be applied to a hardwood floor in 24 hours. Water based poly dries much faster, and several coats (up to 4) can be applied in one day. Water based poly can be walked on with socks in about 4-6 hours after last coat has been applied, while oil based poly must dry for at least 24 hours before walking on it with socks. SMELL: Oil based poly has a very pungent smell and emits a strong chemical odor and noxious fumes while drying that should not be inhaled. Applying oil based poly requires the use of a respirator and your clothes will stink for hours afterwards! We normally advise our clients to be out of the house and also to remove their pets while oil based poly is being applied and drying. Water based poly, on the other hand, has almost no smell. Water based polyurethane is safe to apply without a respirator, and will not stink up the house like an oil based poly. It is safe for people and pets to occupy a house while undergoing coatings of water based poly. THICKNESS AND HARDNESS: Oil based poly is a thicker poly, but it is also softer. Water based poly, an acrylic product, is a thinner, but harder coating. Oil poly can be more susceptible to dents, while water based poly can be more susceptible to surface scratching. Because water based is a thinner product, we recommend 3 coats of water based poly as a minimum, whereas with oil 2 coats are sufficient as a minimum. For people with large pets, we recommend either 3 coats of an oil based poly or 3 coats of Bona Traffic High Durability water based poly. COST: Water based poly is a more expensive product. A 5 gallon bucket of oil base polyurethane costs us around $150.00 to purchase, whereas the same amount of water based poly costs us about $350.00. Expect to pay .50 - $1.00/sf more for a water based polyurethane finish. If your flooring contractor is not charging you more for a water based polyurethane, they are using a cheap brand that will not last! 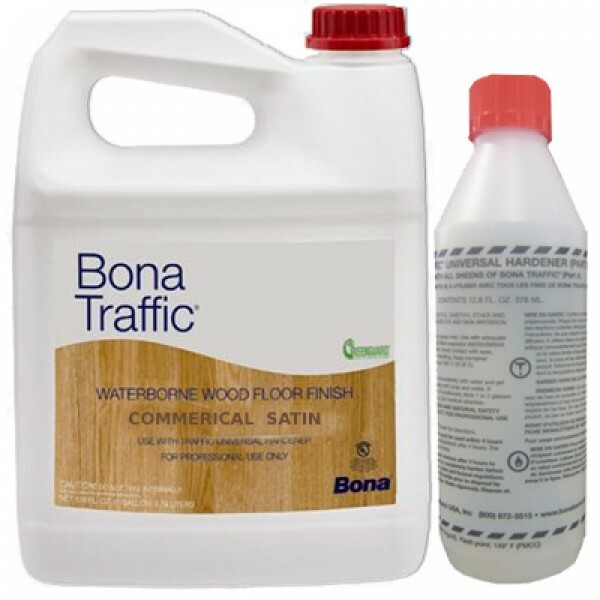 As previously stated, we use only Bona brand water based polyurethanes, as they are the most durable on the market. FEEL: I have heard some people say that water based poly is a rougher finish and doesn’t feel as smooth as an oil based polyurethane. We apply both polyurethanes all the time, and if you hire an expert contractor, either finish should feel as smooth as satin under the feet! INSTANCES THAT REQUIRE WATER BASED POLY: If you are going for a gray stained, white stained or a white-washed hardwood floor, you must use a water based poly, because an oil based poly will make those floors look yellow. Over time, they will continue to look more and more yellow-ish. ICK!! 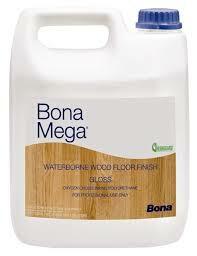 Also certain very light species of wood, such as Maple, look best with a water based poly for the same reasons. Beautiful light-colored Maple turns yellow with application of an oil based poly. We also recommend a water based poly for hardwoods that have a very yellow-ish tone to them naturally, such as Ash, Pine, or Fir, because application of an oil based poly only brings out the yellow tones even more! This is a matter of taste, however, all of our clients with the aforementioned hardwood species have been very happy with the application of a clear water based poly. I have seen Ash, Pine and Fir floors with oil based poly applied and they just scream YELLLLOOOWWWW (even more so over time)!!! Everyone has different tastes and different living conditions, and any competent professional hardwood flooring contractor should be able to offer advice as to which polyurethane is best for any particular situation. Newer PostHARDWOOD FLOOR REFINISHING PROJECT: HOW LONG DOES IT TAKE?